The Prop Den • What's considered an authentic cast? Post subject: What's considered an authentic cast? What would you guys consider an authentic cast? Is a helmet cast from a 20th helmet or mold is considered an authentic cast? To my knowledge the 20thc is directly off a ESB lid. So that would make a 20th c cast a 2nd or 3rd generation cast from an ESB. Post subject: Re: What's considered an authentic cast? I think the 20th Century helmets are generally considered "authentic casts" as they have a confirmed lineage to a production related helmet. However, the 20th sort of straddles the concept of what I think we refer to as "authentic" because it is from a tour helmet rather than a filming helmet. The 20th Century was the king of the hill until the TM and the SL came along, I would also include the VP in this as well but that helmet hasn't propagated as widely as the first two. The 20th has also been the basis for a lot of fan castings that I would be less inclined to include in the "authentic" list. The best 20th Century casting around today is unquestionably the Darth Stone/RS Props casting as it is believed to be one of the actual promotional helmets -- though my memory is fuzzy as to whether this has ever been truly substantiated. Even if it isn't, then it is an excellent copy of one and is not "watered down" like other 20th sourced copies. It has excellent geometry and retains some details found on screen/production sourced helmets. I think one of the underlying questions in the OP is "if the 20th is considered an authentic cast then why is it generally "less desirable" than the TM, et al?" Let me make it clear that what follows is my opinion so take it with a huge grain of sand from the Dune Sea. Firstly, I would say that it largely depends on what you are looking for in a casting. I got the DP Deluxe when it was released in 1995 and at the time I thought it was everything that it was advertised to be. Later when I joined the prop boards and started to learn more about the castings it fed my insanity and I began to desire a helmet that was as close to owning an actual filming helmet as possible -- warts and all. Once you get to this kind of crazy it's the warts that are the talking points. 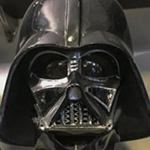 As far as I am concerned there is no "perfect" Darth Vader helmet casting available -- yet (I continue to hope that one surfaces); they all have subtle compromises to them somewhere whether it's slightly wonky geometry or obscured/lost detail. The TM, GS, and SL helmets all have different compromises to them but, to date they are the closest we are able to get to a real filming helmet and are the best representations of the helmet captured in their moments in time. "... I made 18 Vaders for personal appearances in 1995, and I pulled a plaster positive out of the ANH mold, cleaned it up a bit and remolded it, using that for all the masks. I then made my own mounting system using tubes..."
One point in Mr Bies recollection I'm curious about is his statement that he used "the ANH mold". I am going to go out on a limb here and make the assumption that he is talking about a mold/the mold that produced the TM lineage because the RB ANH mold doesn't have the tabs and the tusk tubes have been filleted (the most serious compromise with the RB mold IMO) -- features that don't line up the 20th with the RB ANH mold but do with the TM style castings. This has undoubtedly been beaten to death in other threads I don't care to research right now, lol. So the 20th is an "authentic tour casting" and it's an excellent representation of Darth Vader but for some collectors will fall short and for others will be awesome because it's Darth Vader. Very well put Dave- definitely a 20th Century casting in good condition can be turned into a fine helmet. Currently, the biggest differences between them and the SL and TM helmets, is that they have the "relic" qualities about them, compromised or not. Well... There is also a bit of a size difference between the 20thC and the TM and SL. Also the dome on a 20thC is a bit different from an authentic cast. The other big difference between the 20th and the other authentic casts is all the surface detail, which is mostly (almost completely) absent from the 20thC. In May 1995 I have photographed a heavy silicone/plaster mold of a Vader faceplate in the LFL archives which looked fairly new to me. It had a two-step mount. Perhaps this is the mold where the Rubies Vader statue faceplates originated from? And there were a few of the Don Bies Vader touring faceplates with the single tube mount sitting in the "Vader shelf", so they must have been produced pre-May 1995. If I remember correctly, one of those helmets was the father of the DP deluxe fibreglass Vader helmets. The word "authentic", with regard to castings, is subjective. At one point, the GH vader helmet was considered "authentic". Through the years, our opinions and tastes have changed, mainly due to the slew of new castings that came out. The TD, TM, SL, 20th C, VP, the new Australian helmet and the GS, can all be considered 'authentic" although they are vastly different from each other. I say vastly because to me even a slight change in the curvature or thickness of the eyebrow is huge if I'm comparing faceplates. I don't agree with those who bash tour helmets because, technically speaking, anything out of the Rick Baker mold (like the DJ and SL) is a tour casting. Much like the 20th C, the mold was originally done for touring purposes. The true authentic vader casting would be that plaster cast that still exists, assuming that is the original plaster cast. Anything other than that is just a derivative of it. I agree with Dave; there is no perfect vader casting. They all represent a timeline of the helmet's history. Some better than others, but all subjective in terms of authenticity. At least that's how I look at it. Those are all excellent points as well, Pete! thank you for the information guys. I own a DS ROTJ and was wondering where it fell on the list of authenticity since it has some sort lineage to the originals and has retained a lot of the details from them to. In my opinion I think the ds helmet is the most accurate out of the available fancasts in the market with the best lineage to the original.